No, we’re not talking whiskey. Bourbon biscuits are a type of cookie that is extremely popular in the UK, and is always the one I pick first out of the Christmas biscuit selection tin. Think two sweet chocolate cookies, sandwiched together with a sort of chocolate buttercreamy filling. A bit like an Oreo, but also absolutely nothing like an Oreo. And now I’ve turned them into cupcakes. Confused? There’s a whole load of factors here that come together to make these cupcakes taste remarkably like their namesakes. First up, we’ve got the chocolate cupcakes themselves. These are my tried and tested best ever chocolate cupcakes, which I basically can’t go three weeks without making, with the addition of a little cocoa. Why? Well, because I thought it would make them taste more bourbon-y. These are some seriously top-notch cupcakes, and the cocoa only intensifies the chocolate flavour even more. Pretty much cupcake perfection. You could eat them without any frosting and they’d still be divine. Speaking of frosting – you might be mistaken for thinking this is just some regular chocolate frosting. Well think again, biscuit lover. What you see below actually contains real life bourbon biscuits. Intrigued? The special ingredient in this bourbon frosting is something I am calling ‘bourbon mush’. Put some broken up bourbon biscuits in a small saucepan with some milk, and simmer down until you’ve got something that resembles chocolate porridge. Remove from the heat to cool completely, and then give it a good beating to remove any lumps. If necessary, you can pop it in a blender, but I didn’t find that mine needed this. The bourbon mush gets whipped up with the butter, and then the icing sugar and cocoa is added as usual. I found that the bourbon mush makes the icing a little runnier than usual buttercream, so I’ve reduced down the butter ratio in the recipe below to account for this. You definitely won’t need to add any extra milk to the buttercream, and you may even need to throw in some more icing sugar than usual. That’s okay though, because everyone knows that bourbon biscuits are actually more sweet than chocolatey anyway. It’s what makes them the best biscuit. But what’s the absolute best bit of a bourbon biscuit, an Oreo, or even a custard cream? It’s the filling of course. And in true What Charlotte Baked form, these cupcakes are also hiding a secret filling too. There’s a generous helping of dark chocolate ganache lurking beneath the buttercream – use an apple corer or a knife to hollow out the centre of the cupcakes before you ice them, and fill them back up with my easy microwave chocolate ganache. Use dark chocolate for this rather than milk, as there’s enough sweetness in the icing to last a lifetime. 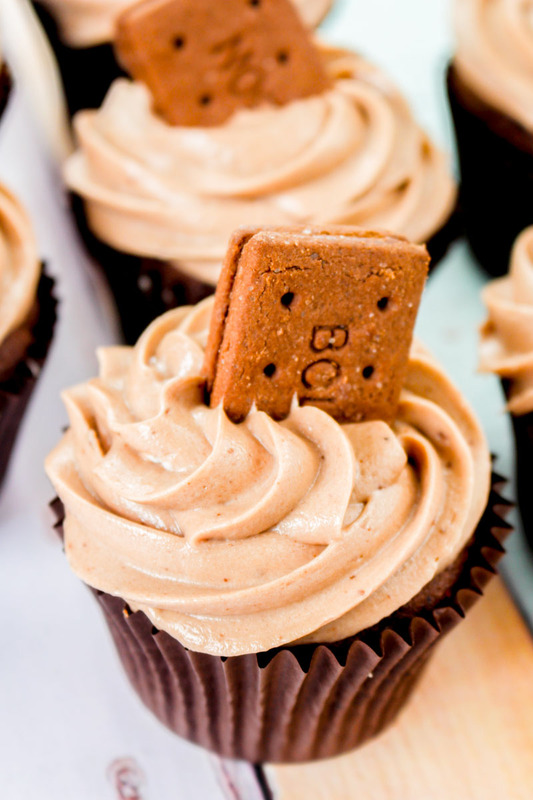 A rich chocolate cupcake, filled with a chocolate ganache centre, and topped with bourbon biscuit buttercream. 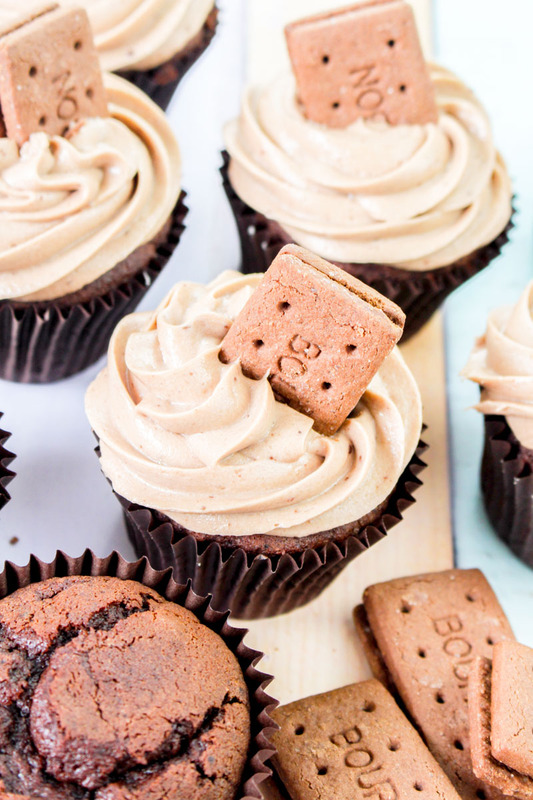 A chocolate bourbon biscuit in cupcake form! Preheat the oven to 190°C / 375°F (170°C fan) and line a cupcake or muffin tin with 14 cupcake liners. Cream the butter using a stand or hand-held mixer, until it is pale and creamy, and has no lumps. Add the sugar and mix well. Add the eggs and egg yolk one at a time, mixing well between each addition. Add the melted chocolate, and beat well. Add the flour, cocoa powder, baking powder, bicarbonate of soda and salt, and mix gently until just combined. Try to avoid over-mixing. Pour in the milk and vanilla extract, and mix gently until fully combined. Fill the cupcake cases ¾ full, as the cupcakes will rise when baking. Put in the oven for 20-22 minutes, or until a skewer or toothpick comes out clean when inserted in the middle. Leave to cool completely on a wire rack before filling and icing. Place the chocolate chips into a microwave safe bowl, and pour on the cream. Give it a stir to ensure that all the chocolate chips are covered, and then top with cubes of butter. Pop in the microwave for 30 seconds, and then stir gently. Return to the microwave for another 30 seconds, and then stir again. If necessary, return to the microwave for another 30 seconds. Stir until you have a thick smooth ganache, and then pop in the fridge for 20 minutes or so until it has thickened up enough to pipe. Remove the centres of the cupcakes with an apple corer or a sharp knife. Pipe or spoon the ganache into the centres of each of the cupcakes, and set aside. Pour the milk into a small saucepan, and add the broken bourbon biscuits. Heat on low and simmer for 5 minutes or so, stirring occasionally, until the biscuits have broken down and a paste has formed. Remove from the heat and leave to cool for half an hour or so. Once the bourbon milk has cooled, spoon it into a large bowl with the butter. Mix with a hand or stand mixer until it is smooth and creamy, and no lumps remain. Add the sifted icing sugar one third at a time, mixing well between each addition. Add the cocoa powder and vanilla extract, and beat again. If necessary, add a little more icing sugar to stiffen enough to be pipe-able. Using a piping bag fitted with a large star nozzle, pipe the buttercream on top of each of the cupcakes. 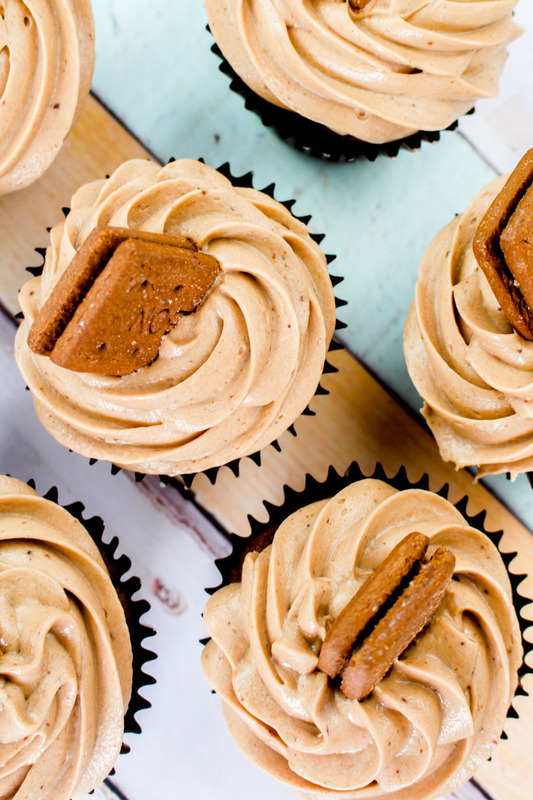 Place half a bourbon biscuit into the top of each of the cupcakes. These cupcakes will stay fresh for 3-4 days if stored in an air tight container in a cool dry place. The unfrosted cupcakes can be frozen for 2-3 months - just defrost at room temperature and then cover with frosting. The frosting can also be frozen for 2-3 months - just defrost overnight in the fridge and then use immediately.